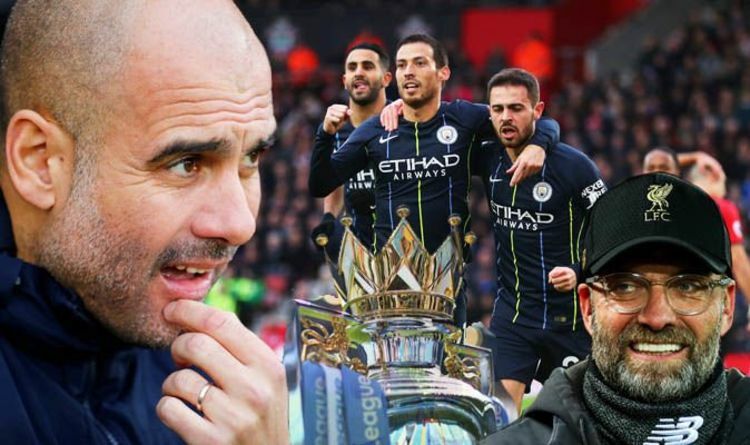 The Spaniard, who led City to Premier League glory last season, says they must not drop any more points if they want to retain the trophy. Liverpool have opened up a seven-point advantage over the reigning champions ahead of Thursday’s showdown at the Etihad. “We knew that with the position of Liverpool, if we drop points then it is over, it is finished,” Guardiola said. Manchester City put successive defeats against Crystal Palace and Leicester behind them as they got back on track at Southampton on Sunday. David Silva’s opener, a James Ward-Prowse own-goal and Sergio Aguero’s header saw them to victory on the south coast. Pierre-Emile Hojbjerg briefly drew Southampton level before being sent off late on. Guardiola said: “What did we have to do to win the game? Play better than previously. You have to move your legs, clear your brain and do something [extra] to win the games. “Do not think maybe the luck is coming. We had to correct our mistakes, we had to analyse and solve it. “Hopefully my last year will be in two seasons or more – hopefully the team will play better. If not, there is no sense. “Liverpool is seven points in front because they don’t concede many and are in incredible form after four years together with Jurgen. “I want to win the Premier League but my mind isn’t changed about what we have to do: get better. “We won a lot of games but unfortunately we lost two and we have a rival who at the moment is the best team in Europe, or in the top four in the world. Southampton manager Ralph Hasenhuttl labelled Hojbjerg’s late red card “a disaster”. Captain Hojbjerg saw red for a wild 85th-minute foul on Fernandinho in Southampton’s 3-1 reverse to City and will now serve a three-game ban. Hasenhuttl said: “The worst moment was with the red card for Pierre Hojbjerg. It hurts us a lot. It’s a disaster for me. This was a silly tackle on 85 minutes against Man City when it’s 3-1 and the game is gone. Southampton also face an anxious wait to see if striker Charlie Austin is punished for aiming an offensive gesture at City fans. Austin appeared to wave two fingers towards the travelling suport when he was subbed off in the second half, an incident that could land him in hot water with the FA.